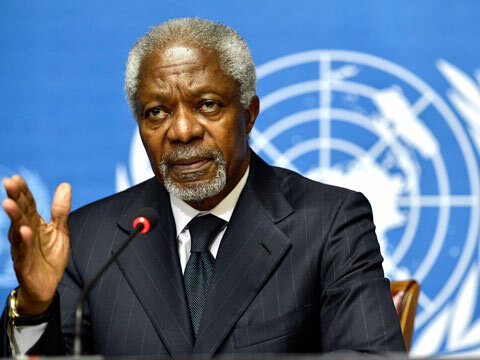 Kofi Annan, former UN secretary-general and chair of Africa Progress Panel. Amid continuing calls to increase primary school enrolment in Africa, a new report urges greater emphasis on the quality of what students learn. The Africa Progress Panel, a policy think tank chaired by Kofi Annan, former UN secretary-general, noted in September that "many of the children in school are receiving an education of such abysmal quality that they are learning very little." Its report, entitled A Twin Education Crisis Is Holding Back Africa, says that Africa's children are leaving school "lacking basic literacy and numeracy" and without "21st century skills." The report argues that while African governments have rightly stressed the importance of macroeconomic growth, such growth can only have a lasting impact if the continent's people have the necessary skills and capabilities. The report recommends a three-step solution. First, African countries must strive to meet the Millennium Development Goal of achieving universal primary education by 2015. Second, they must pay more attention to the quality of education. And third, they should ensure that poverty, living in rural or conflict regions, or being female do not impede children's education. According to the UN Educational, Scientific and Cultural Organisation (UNESCO), the percentage of African children in primary school increased from 60% in 2000 to 76% in 2009, while the number of children out of school dropped from 42 million to 30 million. The panel report highlights progress in a number of countries. Tanzania had more than 3 million out-of-school children in 2000, but is currently "within touching distance of universal primary education." It adds, "From Burkina Faso to Ethiopia, Mozambique, Senegal and Zambia, one country after another has made a breakthrough in enrolment." Still, Africa as a whole may not meet the 2015 MDG education target. "If the trend from 2005 to 2009 is continued, there will still be 17 million [children] out-of-school in 2025," maintains the report. Annan said, "Given the critical place of education in poverty reduction and job creation, we urge governments to deliver on the commitment to provide education for all by 2015 and to strengthen their focus on learning achievement."